Preheat the oven to 180°C/350°F. Line 2 spring form pans with parchment paper. To make the cake batter, add sugar and butter to a stand mixer fitted with a paddle, beat until creamy. Add eggs, egg whites, light crème fraîche and vanilla extract. Stir in the dulce de leche. Mix baking powder, ground nutmeg, and ground allspice with the flour, then add to the stand mixer a spoonful at a time. Add chopped pecans and milk. Mix everything together at low speed. Divide the batter equally between the two spring forms. Bake side by side in the oven at 180°C/350° for approx. 35min. To make the candied kumquats, slice kumquats, and remove any seeds. Scrape out seeds of vanilla bean. Add vanilla bean and seeds, sliced kumquats to a pot. Then add sugar and rum. Simmer on low heat. Cook for approx. 15 min, or until kumquats are soft and candied. To make the caramel sauce, heat sugar in a saucepan and let caramelize. Stir in cream until combined. To make the frosting, add remaining butter to the stand mixer, beat at high speed for approx. 5 min. Stir in remaining dulce de leche gradually and beat until the mixture is creamy. Remove the cake from oven let cool down for approx. 30 min. Level cake tops with a sharp knife. Coat the bottom cake later with some of the caramel frosting and then add some of candied kumquats on top. Place the second cake layer on top and cover the top and sides of the with the remaining frosting. 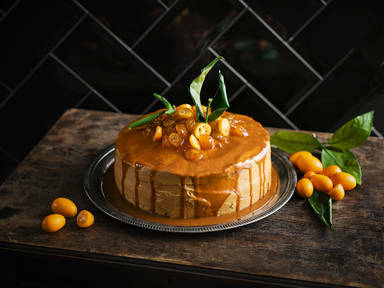 Pour caramel sauce over the cake and garnish with the remaining candied kumquats. Enjoy!